These Pepperoni Pizza Stuffed Homemade Soft Pretzels are actually easy to make, delicious, and stuffed with cheese and pepperoni! They are perfect for March Madness, fall football parties, a delicious snack, and even dinner! Soft pretzels are my absolute favorite. If they are ever on the menu, I always jump at the chance to get them. Man, are they the perfect party snack. In fact, I like to take soft pretzels to any type of pot luck situation. I pop them in the oven to warm them back up just before we eat and everyone loves them. Rosemary Garlic Stuffed Soft Pretzels are filled with gooey mozzarella cheese, full of flavor, easy to make and will impress your dinner guests. They are so delicious that you might want to double the recipe! Since starting my herb garden, I’ve found myself experimenting with more herbs. I usually have some type of herb garden every year but this year is by far the biggest. The best part is that I planned ahead and put them all in pots so that I can keep them going year round. I’ve got a lamp ready to go for the cold midwestern months for the first time ever so cross your fingers that I can make it happen! Usually when I experiment with soft pretzels, it’s all about paring them with an amazing dip. However, when I go to one of my favorite restaurants in Chicago, I’m always drawn to the cheese stuffed soft pretzels–mostly after a few drinks (ha!). If you can’t tell by the number of soft pretzel recipes on this blog, I LOVE soft pretzels. So much carb-ey goodness. Homemade Everything Soft Pretzels are absolutely delicious and pretty easy to make. The everything spice on these soft pretzels paired with this creamy pretzel cheese dip is so dang good that you think they came from the bar. One of my favorite party foods to bring is soft pretzels. They are impressive and actually not hard to make at all. 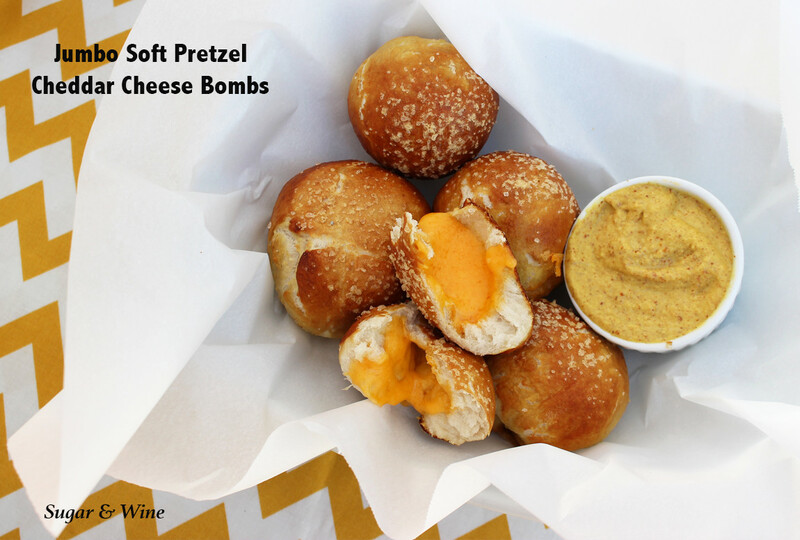 I started off just making basic pretzels with mustard or a cheese dip but in the last year I’ve really started to experiment with them like these Jumbo Cheddar Cheese Soft Pretzel Bombs. I also make some mean cinnamon sugar soft pretzels bites with a vanilla icing dip. I’ll share that recipe with you in the fall! MMMM….I’m getting hungry for pretzels again. Don’t get scared away by the number of steps that are involved. The steps look like a lot but they really aren’t. Most of the time spent is waiting for the dough to rise. And, the time spent is so worth it. They are so delicious…. I love sushi! I usually have sushi with my friends at a local sushi restaurant in Chicago. But, not everyone has access to a good sushi restaurant. If you frequent sushi restaurants, then you know when you find a good sushi place. It is your golden gem in the middle of the city. However, a lot of folks do not have a local sushi place, let alone a good sushi place. When I go back to my hometown, there isn’t a sushi place at all so when I get a sushi craving, I’m out of luck. Sometimes I have plenty of time to put together appetizers for guests or parties. I’ll have a fun menu and spend two days cooking and baking. Then, there are other times I’m not in the mood to be in the kitchen or simply don’t have time. 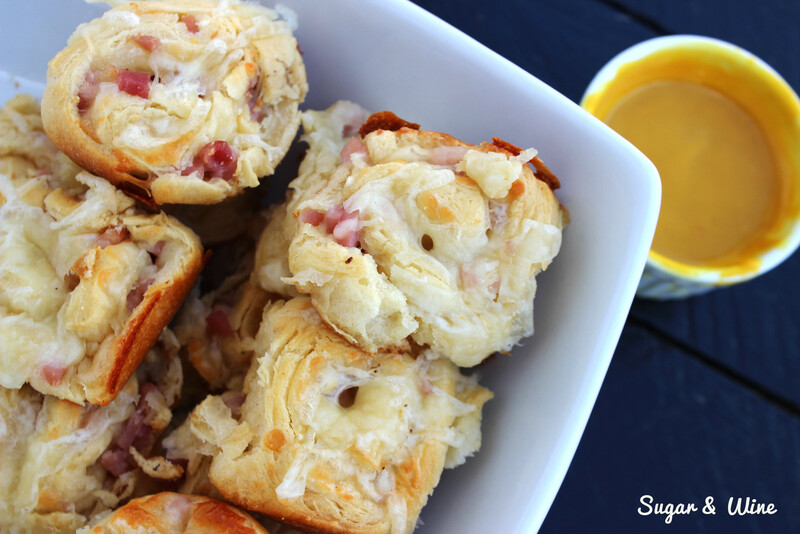 That’s where these Ham & Cheese Crescent Bites come in to play. I would call them pinwheels if they would actually stay in a pinwheel shape but because these are smaller bites they don’t hold their form too well. So, bites it is! And, really, who cares what they are called because they take 18 minutes and 15 minutes of that is baking time—and they are delicious! They are so easy that you can whip them up for lunch or dinner when you are being lazy, running short on time, or have some last minute guests show up. I pair these bites with a homemade honey mustard and I had to limit myself from eating the entire bowl of bites. So, so flaky, cheesy, and tangy. Comfort food is part of what makes autumn warm and cozy. I’m back into the kitchen with a buzz of cooler weather and a warm oven! I have to confess though: this morning started with a mess. I’m obsessed with apples and wanted to make some soft pretzels stuffed with apples and cinnamon. My tried and true fashion of stuffing pretzels did not work. They exploded, they didn’t get dipped right into the baking soda mixture. I couldn’t even close some of them. So, I scrapped it and started over. I will eventually make those apple cinnamon stuffed pretzels but I’m back to the drawing board with those. All was not lost though. Soft pretzel dough is so easy to make that I whipped up another batch and away we went with a key recipe of mine: jumbo soft pretzel cheddar cheese bombs! These are so delicious and a perfect party snack. They ooze with cheese and paired with a hot mustard, I couldn’t stop eating them. We have two weeks of September left and fall officially starts next week! This means that I get to pumpkin, apple, fall/Halloween it up like crazy (and without judgement)!! As you all know, fall is my favorite season. Its fun, it has the best holidays and is warm, cozy, and comfortable. Its my time to start fresh and get back in to the kitchen. The big thing about fall is that I am busy. You are busy. If you have kids, your kids are busy. We do it all in the fall. 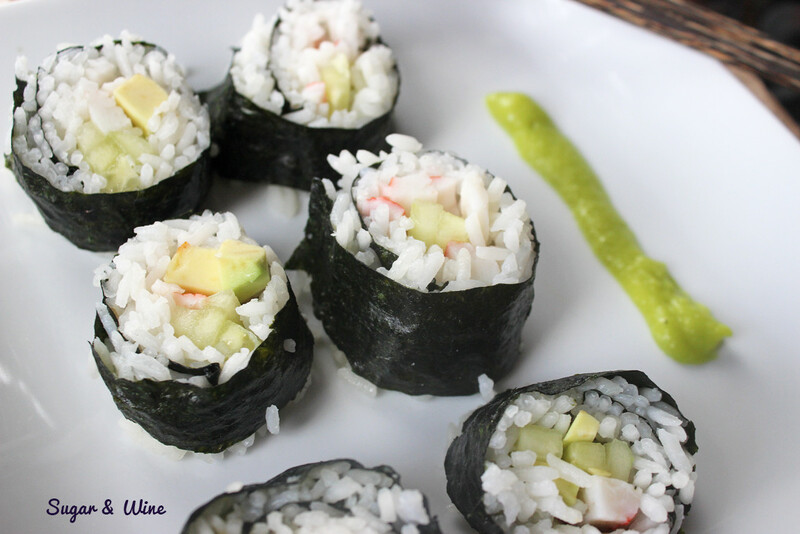 Today’s recipe is something totally fun and easy to do. Plus, these Pumpkin Marshmallow Treats can impress your guests or hostess without a lot of work from you. What more can you ask for? 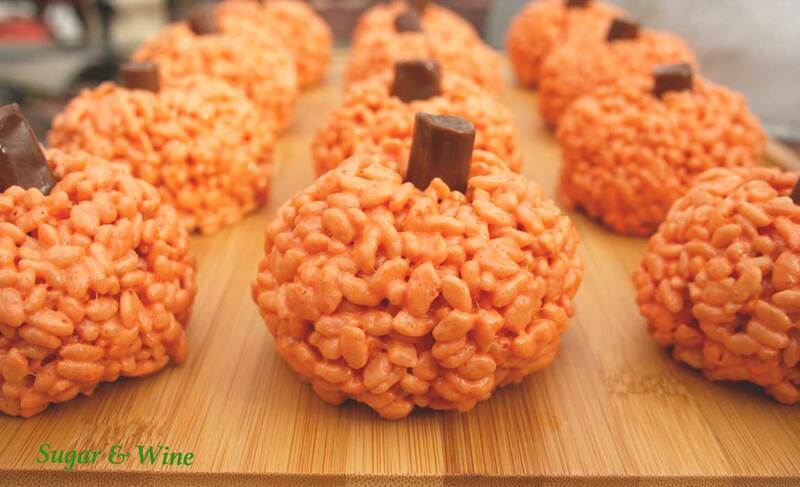 Whether you are having friends over or a kids party, these little pumpkin are fun to make and fun to eat. Happy September! The end of the summer is quickly approaching and that means football season here. The trips to the bars to watch the game are on the rise—as is hosting parties and gatherings. Playing hostess is one of my favorite things to do. It took a while for me to grow into that role though. Today’s recipe is a great way to bring bar treats to your home parties. Soft pretzels are one of my favorites treats. For me, soft pretzels are quintessential fall treats so they are something you will see featured in the next couple of months on Sugar & Wine. Other fun additions to the blog in the coming weeks are my fall entertaining guide and fall tablescapes. Fall and winter have some of the most beautiful tablescape opportunities and I’ve been working hard on a few to inspire your tables this season. Now, these soft pretzels are my standard base recipe, which I’m sharing below, but they can be made into sticks, rolls, bites, and the standard pretzel shape. So, go grab some beer and some spicy mustard and then get into the kitchen and make some of these pretzels. You will be the hostess with the mostess at your next party!